A good blizzard always brings out the best in city folks. Sunday, as many emerged from their snowbound homes for the first time, I saw dozens of my neighbors out and about, shoveling their walks, or their elderly neighbor's walks, and helping people dig their cars out. Everyone was cheerful an enjoying the glorious, sunny post-snow day. It also brings out the strange. While not a unique phenomenon, in DC, the act of digging your car out of a street spot apparently grants you ownership of it until the snow melts. As quickly as cars started moving out of their snowy prisons and onto the crusty streets, the vacant spots were filled with pylons, lawn chairs, and pleading notes and candy canes. Gotta love the hippies... I'm guessing the lawn chairs were more effective. My favorite one is below. Monday around noon, I saw this one on Webster Street NW. It cracked me up so I took a picture. If you can't see what's behind the chair in shot #1, proceed to shot #2 for a better view. On my way to work this morning, at 7:15 AM, I was pleased to see that the ironing board was, in fact, an effective way to keep people from stealing your hard-earned spot. I do have to wonder how they will press their shirts for Christmas Eve, though. Hmm... that looks a like a pretty nice dining room chair, too. It's going to be a wrinkly, standing-room-only Christmas dinner, I guess. As hilarious as this is, it does beg the question. Clearly, someone is willing to go to great lengths to defend their parking spot, nay, their honor against any and all invaders. 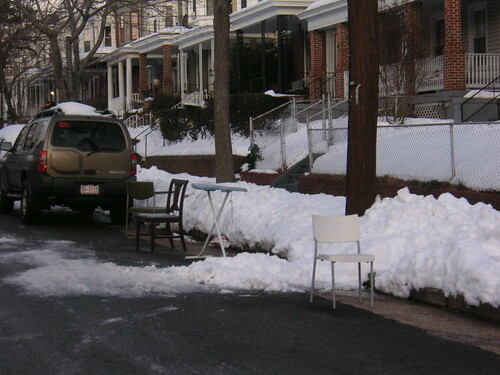 They have moved much of the contents of their dining room, and laundry room, to the sidewalk in order to ensure parking. So far, I've observed the spot twice, occupied only by furniture and laundry accessories. No sign of a car, either at noon on Monday, or at 7:15 AM, two days later. In this day and age it seems that parking, even rarely needed parking, is now at least as valuable as your home furnishings. yeah, that place is just around the corner from our house and i haven't seen anyone parking there, day or night. I guess you just hold your spot for a week until Christmas guests come? 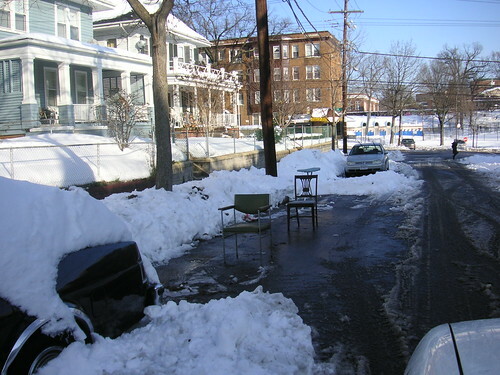 I think digging out may earn you a few hours of a reserved spot, but beyond that the streets belong to everybody. I'd be tempted to make off with some of that furniture.